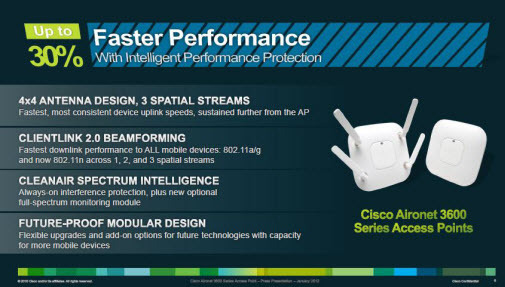 Cisco launched its latest enterprise access point—Cisco Aironet 3600 Series Access Point with corporate bring-your-own-device policies in mind, aiming to address the growing demand for fast network performance and consistent connectivity that is being fueled by the rapid growth of mobile devices and mobile network traffic. The Aironet 3600 includes the company’s ClientLink 2.0 software. ClientLink allows the AP to compensate for the limitations of weaker client devices and improve the speed of all clients on the network, though laptops with three-stream capability still may get more speed than tablets and phones, said Sujai Hajela, vice president and general manager of Cisco’s Wireless Networking Business Unit. The unit also supports the IEEE 802.11r and 802.11u. 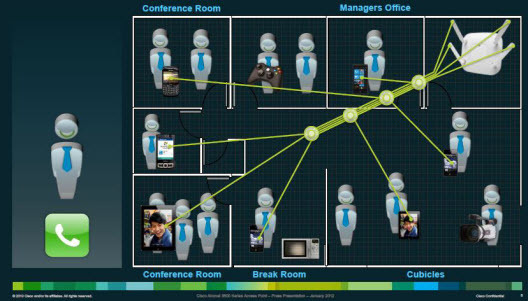 802.11r enables mobile devices to move between access points without breaking a session, a critical requirement for many applications, Cisco says. 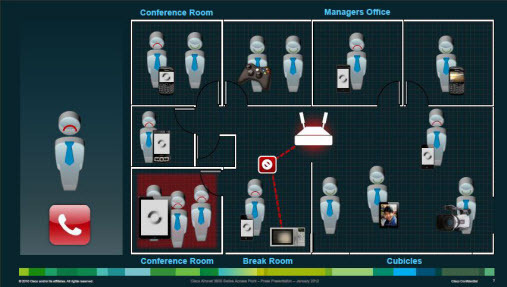 802.11u enables the access point to communicate available network services to mobile devices. Cisco claims to be the first vendor to support both these standards. With four antennae and 30 percent more performance, Cisco is hoping the Aironet can account for multiple spatial streams—the path between the wireless signals served by an antenna and a device—and hit multiple devices. For instance, an iPad could use one spatial stream, a laptop would occupy two and an iPhone could have another. The Aironet routers also have slots built in so new radios can be added whether they are Wi-Fi or cellular. The new Cisco Aironet 3600 Series AP is available worldwide immediately for a list price of $1,495 with internal antennas and $1,595 with external antennas. The add-on scanning component is scheduled to ship by the end of this year. It offers customers a path to ensuring their wireless network infrastructures are able to cope with growing demand. –Fastest Performance: With 30 percent faster performance, the Cisco Aironet 3600 Series 802.11n AP is designed to allow people to take advantage of cloud-based services, run virtual desktops with less lag time, or have smooth video calls, all resulting in better user experience. –Higher Speed at a Greater Distance: The fourth antenna on the Cisco Aironet 3600 Series AP allows for greater mobile flexibility as more people can be wirelessly connected from more devices spread further from the access point while maintaining a fast and reliable wireless connection. –High-Quality Experience with Any Device Client: The Cisco Aironet 3600 Series AP includes the new ClientLink 2.0, which can boost performance for 100 percent of wireless client devices connected to the access point, regardless of the device’s wireless signal strength and spatial stream category. –ClientLink 2.0 can improve performance for all mobile devices in 802.11a/g and now 802.11n across one, two and three spatial streams — from high-end laptops, smartphones and tablets to industry-specific devices to older wireless devices. It addresses the challenge of reliably connecting slower devices with weaker wireless signals, such as tablets. –Investment Protection with Flexible Design: The access point’s flexible, modular design allows businesses to customize it depending on their needs with add-on modules that provide additional functionality. The access point also provides greater capacity to support additional devices as a business’ needs and user base grow. –Performance Protection: The Cisco Aironet 3600 Series AP includes Cisco CleanAir(TM) technology to help protect performance, increase reliability, and deliver unprecedented radio frequency (RF) spectrum troubleshooting, resulting in the best, highly secure experience. –Cisco is also announcing a new, optional RF monitoring module with Cisco CleanAir. The new module can provide full visibility into the complete Wi-Fi spectrum — all 23 channels rather than just the traffic-serving channel. By proactively and simultaneously scanning the entire Wi-Fi spectrum for interference and security threats, the monitoring module can intelligently and automatically choose the best channel to serve traffic, delivering the best user experience and fast, reliable performance. –Driving Innovation Through Standards with Support for 802.11r and 802.11u: Cisco continues to drive industry leadership and innovation by being the first to support standards-based fast roaming with IEEE 802.11r on the new Cisco Aironet 3600 Series AP. Fast roaming with 802.11r can allow clients to move between access points without breaking a session, a critical requirement for many applications. Cisco led the effort to evolve Cisco Centralized Key Management into the 802.11r standard and is now leading again by being the first to support this standard. Additionally, Cisco is also first to support 802.11u on the Cisco Aironet 3600 Series AP, which will drive richer and simpler mobile experiences by allowing the network to communicate available network services to mobile devices. –Simplified Manageability and Security: The Cisco Aironet 3600 Series AP is supported by Cisco Prime Network Control System (NCS) and Cisco Identity Services Engine (ISE), creating a unique ability to address the “Bring Your Own Device” challenge. Unified policy and access control in Cisco ISE and converged wired/wireless management in Cisco Prime NCS, together with Cisco wireless LAN infrastructure, simplify and help secure the mobile experience. 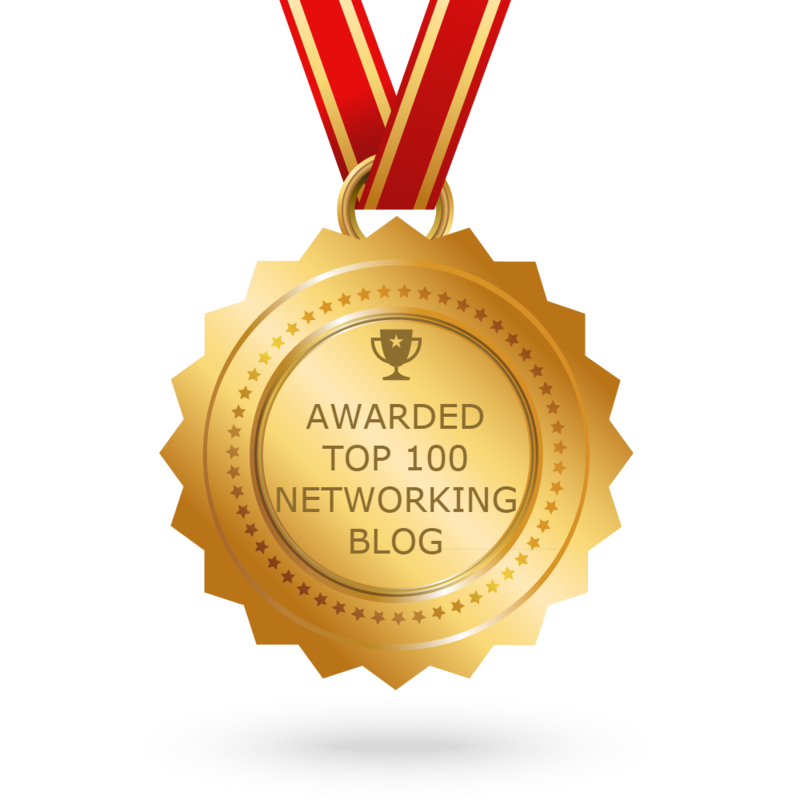 More Cisco News: Competitive Analysis: Why Cisco, Not Juniper?